Probation Officer Andrew Szteiter and Judges Robert Hickson and Thomas Elkin spoke at drug court graduation about the mission and value of the drug court program. 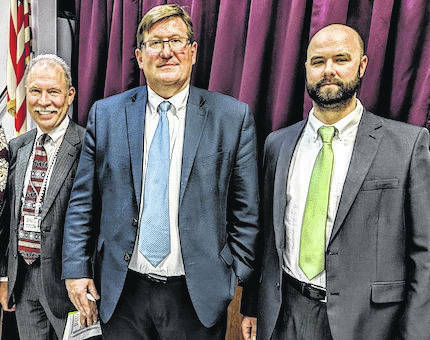 MOUNT GILEAD — Probation Officer Andrew Szteiter and Judges Robert Hickson and Thomas Elkin spoke at the recent drug court graduation about the mission and value of the drug court program. Hickson said that the drug court program requires commitment in the beginning and needs a plan, which takes discipline to achieve. Hickson emphasized that it takes time to build trust for those who are working at becoming clean and sober. First you have to build trust with yourself, then with family, work and friends. The court is now following the rate of recidivism or re-offending in the drug court program for 3-5 years. At the time of sentencing, the judge orders a screening for the Morrow County Substance Abuse Court, based on the criminal conviction and current and/or past history of drug use. The participant is screened for acceptance, and if they meet the criteria, they are accepted and begin the program and the docket for which they are qualified. The Drug Court has three phases: Phase 1, Phase 2 and Phase 3. Each participant progresses through the phases after completing certain criteria: sobriety time, intervention based treatment completion, alcohol and drug treatment, motivation, attitude and participation in the program. Also factoring into progress into the next phase is whether participants maintain employment, participate in AA/NA and compliance with reporting. The presiding judge, supervising Probation Officer and members of the treatment team discuss each participant’s progress bi-weekly during a pre-court conference. This determines whether a participant is compliant and/or ready to advance to the next phase. Once a participant has completed all the requirements in Phase 3, they are eligible to graduate the Drug Court program. The drug court dockets have a treatment team which assists in each participant’s recovery process. It consists of treatment providers from the following agencies: Maryhaven, Recovery and Prevention Resource, Southeast, Access and Abraxas. Chief Probation Officer, Greg Thomas said the Drug Court’s current four dockets are: Felony, Intervention in Lieu of Conviction, Family, which are Job and Family Service cases seeking to get back custody of children and Juvenile. Probation Officer Renee Watts is the supervising officer for Intervention in Lieu, Juvenile and Family Dockets. Judge Hickson is presiding judge. There are Currently 2 juvenile participants, 4 intervention in lieu and 14 family participants. 7 graduated on Jan. 5th from the Family and Intervention in Lieu dockets. Probation Officer, Andrew Szteiter is the supervising officer for the Felony docket. Judge Tom Elkin is the presiding judge. Currently there are 35 participants with 8 graduating on Jan. 5.
https://www.morrowcountysentinel.com/wp-content/uploads/sites/29/2018/01/web1_JUDGES.jpgProbation Officer Andrew Szteiter and Judges Robert Hickson and Thomas Elkin spoke at drug court graduation about the mission and value of the drug court program.